To celebrate Israel's 70th Independence Day on May 14th, there will be a "March of Nations" - like Sukkot only with an emphasis on Holocaust survivors, if you can fathom that - on May 15th. 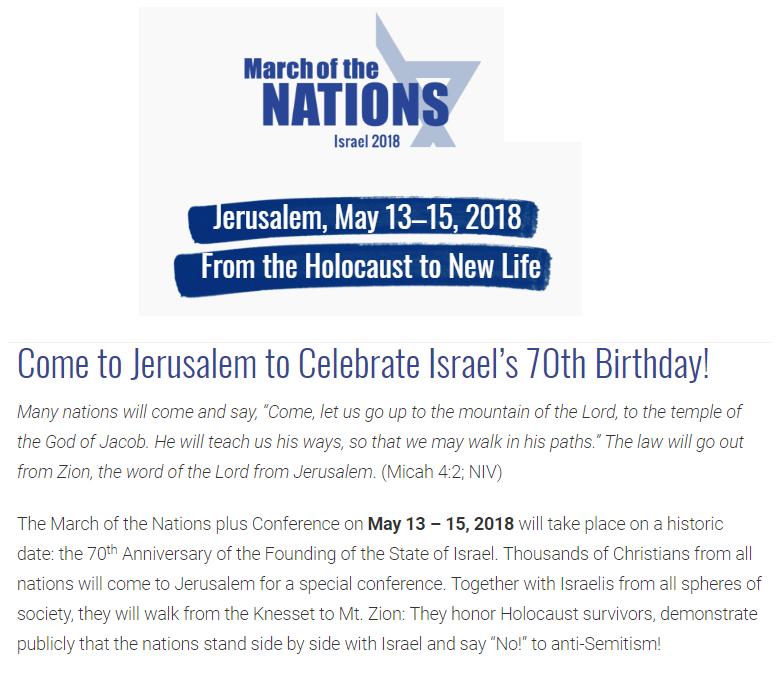 Calling it a march of "nations" is a bit of a misnomer because this is most assuredly a Christian event - a joint US Christian, EU Christian, and Israeli-Messianics event. It takes place from 13 May through 15 May, culminating in the "march" on the 15th. Join us for this once-in-a-lifetime tour as we experience Israel's special 70th birthday celebration! ...see the city of the great King [Yeshu]...Jerusalem! Gain a unique Judeo-Christian understanding of Israel, the land of the scriptures! Visit Jewish and Christian treasured places, and receive inspiration from Rabbi Dan Gordon, Rabbinic advisor to the National March of Remembrance. Hear key historical information from Holocaust studies professor, David Lawhon, participate in the March of the Nations, as thousands of Jews and Christians show their support for Israel, and proclaim the enduring value of Jewish life in the world. See the contrast of ancient and modern, and experience the international texture of Israeli culture. Join key March of Remembrance leaders and friends experiencing this once in a lifetime special celebration—Israel’s 70th birthday. Participate in all the events for this historical March of the Nations that will take place on May 13–15, 2018, a historic date: the 70th Anniversary of the Founding of the State of Israel. Jews and Christians from all nations will come to Jerusalem for a special conference. Together with Israelis from all spheres of society, those physically able will walk from the Knesset to Mt. Zion: We will honor Holocaust survivors, demonstrate publicly that the nations stand side by side with Israel and say “No!” to anti-Semitism! So, there you have it, a march from the point of political secular power to the point of Christian religious power - Mt. Zion - which was handed over to the Vatican by that same secular government! How symbolic!! I saw lots of xtian tourists downtown this afternoon. A lot of Asians. Maybe Tibetans or something similar. There were plenty of them with their tour guides. I heard this from others as well. When questioned, many of them say they are here for the March of the Nations and the conference at Binyanei Hauma. Yes, another Christian Dominionist, Michelle Bachman. Quote: "Speaking with the radio show “Washington Watch” in November 2015, Bachmann called for efforts to convert Jews en masse to Christianity to hasten the End of Days. On Sunday, however, Bachmann said she ‘repented’ for the “horrible and arrogant way” she and other Christians had treated Jewish in the past. Using the Hebrew term for God, “Hashem”, Bachmann said she had a profound change of heart since her 2015 comments. Likud MK and Temple Mount activist Rabbi Yehuda Glick took part in the special event at the Knesset, along with Kfar Shmaryahu’s Rabbi Oriel Einhorn, Rabbi Tuly Weisz, and leaders of the American Evangelical “Schindler Society”, Jim Garlow and his wife Rosemary Schindler Garlow." Don't understand why our people are so naive and even stupid to believe and go along with all this fanfare with the goyim. Over 2000 years of hatred and Jewish bloodshed and 'learned nothing'. It's like the tumah of the Erev Rav (black magic) has a hold over most of our nation, in holy EY and in the galut. 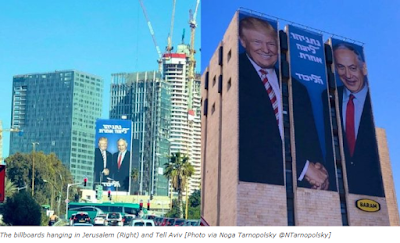 At least they're not holding all this treifus on Yom Yerushalayim (gematria 28 'koach') and holding these marches and parades (so goyish) tomorrow. 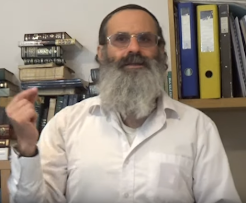 Guess our people always have to learn the hard way; but please H', this time let it be b'rachamim and a nes m'Shamayim that HE also blesses the nation with wisdom to see the truth from their falsehoods.